The 2013 Academy Sports and Outdoors HT Invitational Series as well as the Shock H2O Tour will partner with a real Head Turning graphics design company called Compadres Ink. When it comes to professional angling, Image is Everything and no one can create or enhance our tour anglers like Compadres Ink. From the first preliminary phone call to the terms of agreement two things were obvious, these guys turn out fantastic artwork and they want their customers 100% satisfied, that makes it a natural fit to us. The company is located in Victoria Texas, more than a thousand miles from our base of Orlando Florida but their design eye and quality of work is greater than the distance between our two companies. In addition to wrapping several of our professional teams boats and trucks Compadres Ink will be designing a new look for the 40' HT Tournament rig as well as the tour's hauler, an Ford F450. With tour stops in the 2013 season spanning from Orange Beach, Al. all the way to south Texas our teams will once again show up in Head Turning style. We are excited for the obvious benefit to our tour but that alone was not enough to Ink this deal. In a late afternoon discussion the folks at Compadres stated "we want to be a big part of the tour, we'd like to be at the events as well as possibly coming up with an angler incentive plan by which teams that win an event on the HT Professional Redfish Series while fishing from an Compadres Ink wrapped boat would win bonus dollars". That's the kind of thinking we like, it's not enough to only benefit the tour but benefit the anglers, the environment and the communities in which the tour holds their events. 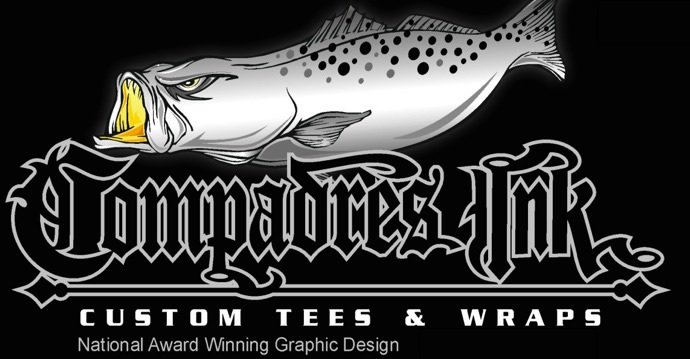 Again, it is with great excitement that we announce this partnering and we invite you to visit Compadres Ink website to check out their award winning designs and work together with their designers to come up with a one of a kind Head Turning look for your boat, tow vehicle, work trucks and/or just about anything else that can be pushed, pulled or dragged into their 2000 soon to be 4000 sq foot facility. 2013 is shaping up to be another banner year, no pun intended and we are proud to have Compadres Ink as a major part of our Series and Tour. Check back at the HT Fan Page as the tour's rolling 40' stage and Ford F450 get their facelift in preperation for the 2013 tournament season and see them both in person as well as meet the fine folks from Compadres Ink who will be on hand, January 25th and 26th at the S.C.B. Baffin Trout tournament in Rockport, TX..